I hope the first half of your week has been going well. 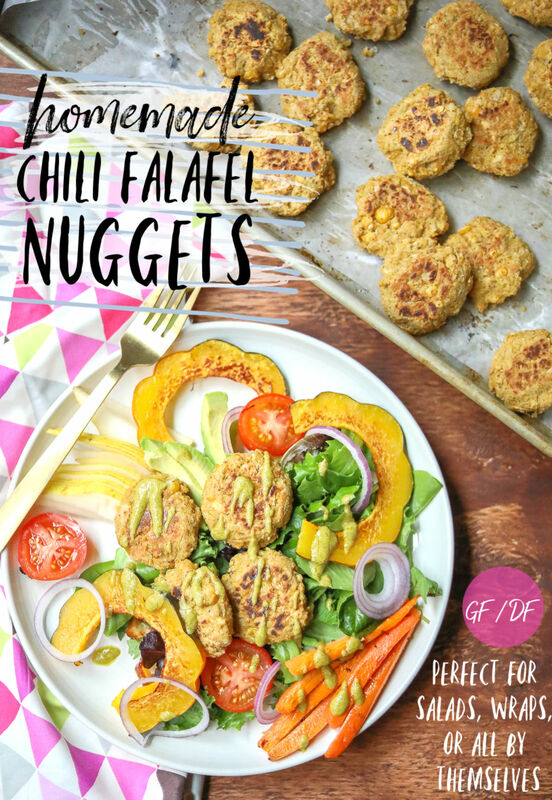 I’m just dropping in today to share a quick recipe for some delicious chili falafel nuggets! I created this recipe last week when I had no idea what to make for lunch. I didn’t have much in the fridge, so I pulled out a couple of cans of chickpeas beans, and whipped these delicious babies up in fifteen minutes! 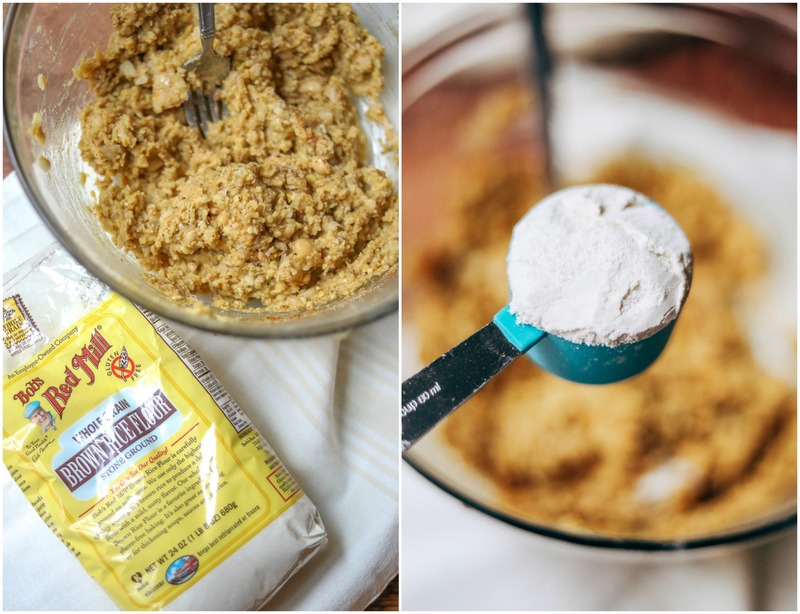 Falafels are one of my favorite foods, and they are so easy to make! I added a fun chili spin to these to make them warm and more fallesque (my favorite word that’s not actually a word but should be a word). Falafels can be thrown into your wraps, salads, as side dishes, and sometimes I add them into soups as a dumpling replacement. It’s good; you should try it! The first time I ever tried a falafel was ten years ago while visiting my brother at the University of Iowa. He took me to Pita Pit and I ordered a caesar falafel pita wrap, per his recommendation. I had no idea what a falafel was and I was a bit hesitant. I took one bite and fell in love! Why, oh, why did it take me so long to try this delicious dish? A falafel is a middle eastern dish that consists of mashed chickpeas, formed into a ball and fried. Every time I order a falafel from somewhere, it’s always unique and never the same as the last falafel I’ve had. I love that you can put a spin on it, and that’s what I did with these! 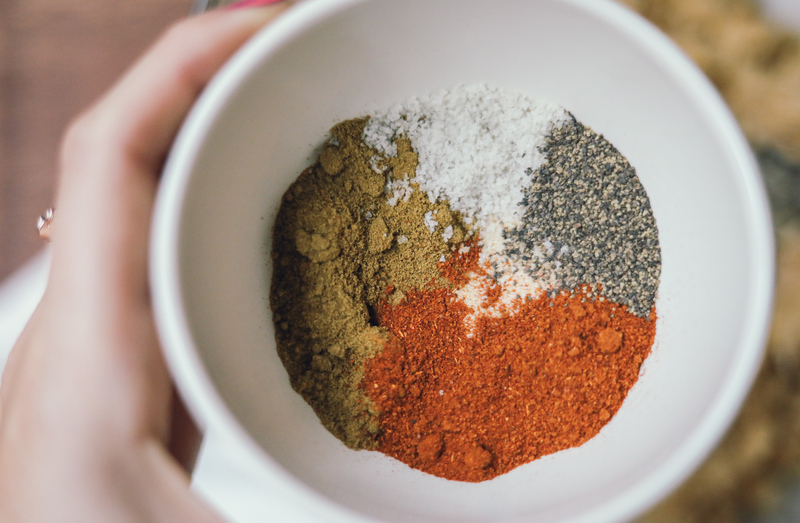 For my spices, I used sea salt, chili powder, cumin, black pepper, garlic powder, dill weed, and onion powder. Add avocado oil to the bottom of a frying pan. I didn’t deep fry these, but lightly cooked them on each side for about five minutes. I haven’t tried baking them, but you could if you wanted to! 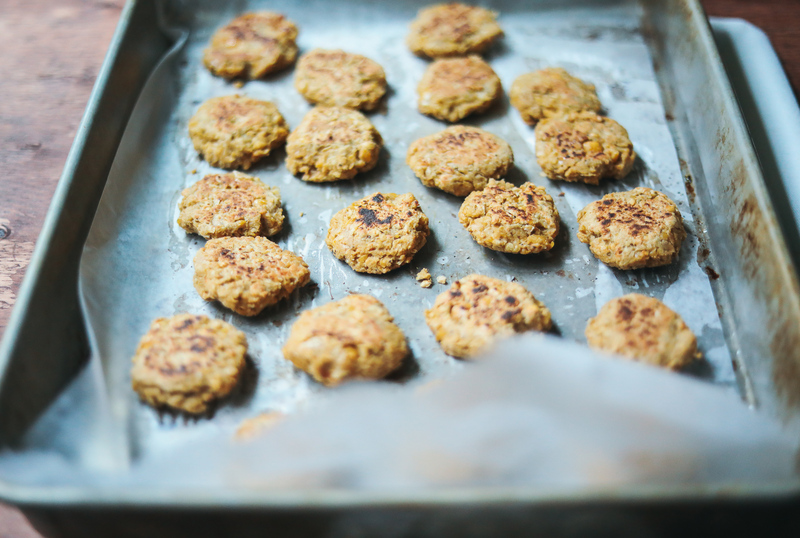 This recipe makes 35 falafel nuggets! I stored them in the fridge and ate them all week long. Kyle also enjoyed them. Sometimes, I’d spread Kite-Hill chive almond based cream cheese on top for a savory treat. 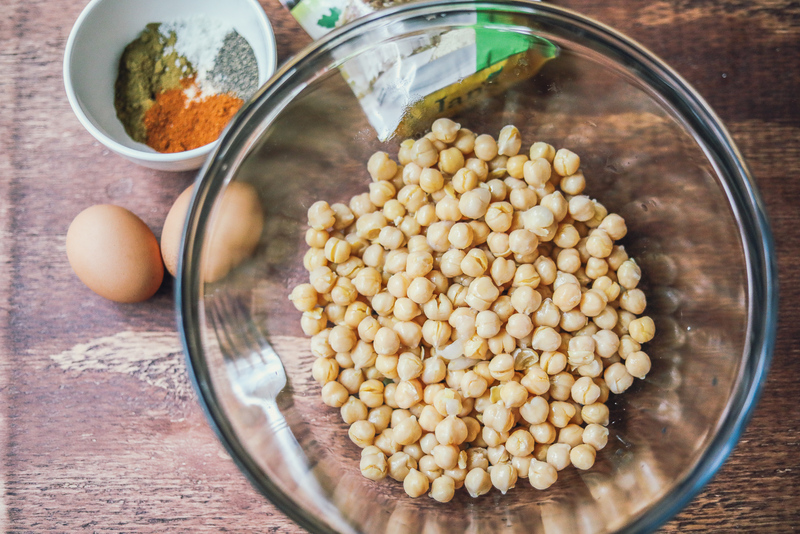 Drain chickpeas and add them to a large mixing bowl. 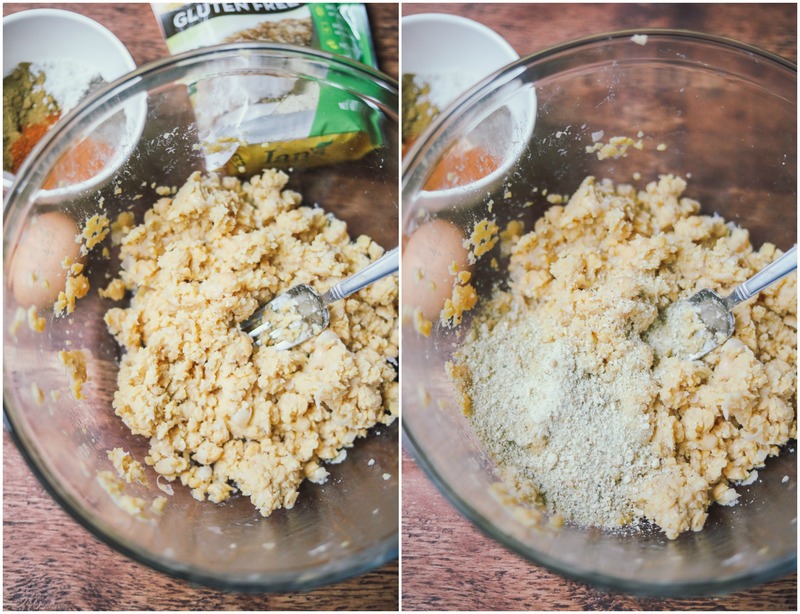 Mash with a fork, or use a blender/food processor to mash. 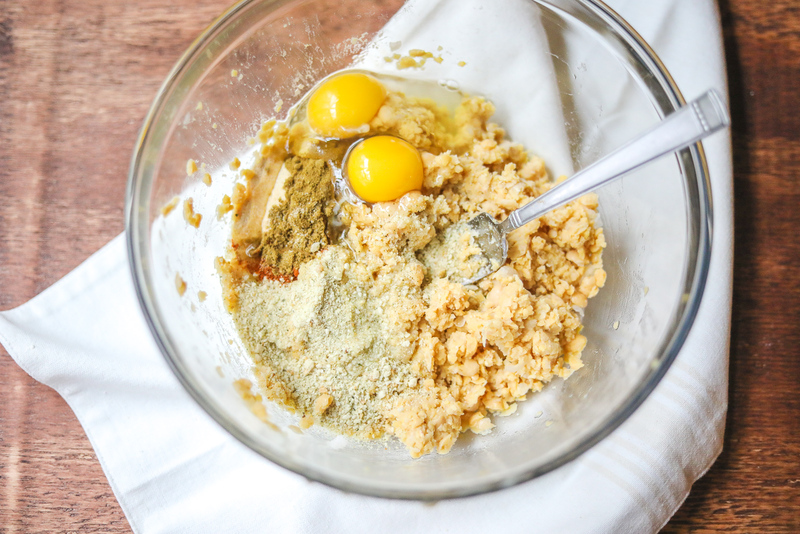 Mix the chickpeas with the eggs, breadcrumbs, flour, and seasonings. Grease a pan with avocado oil and heat to medium-high. 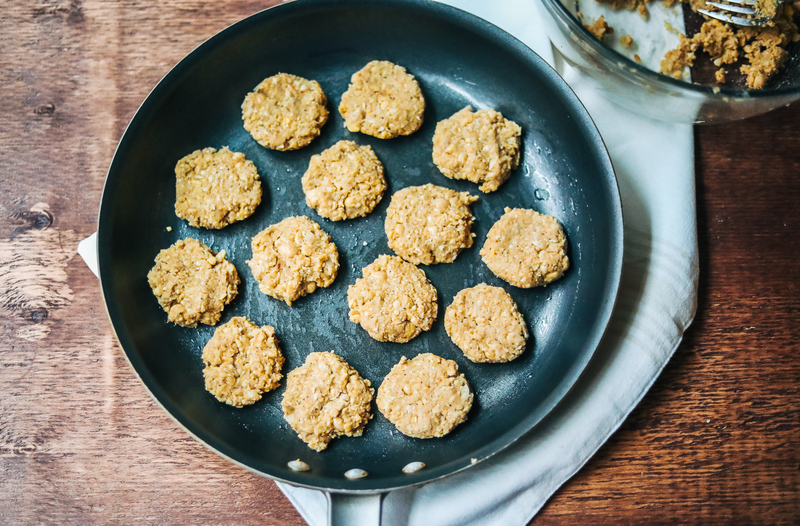 Form two-tablespoon sized nuggets with the falafel mix and cook each side for about fifteen minutes. They should be golden brown. Have you ever made falafel at home? Describe your day TODAY in one world. Do you call them Garbanzo beans or Chickpeas? I’m making these tonight! 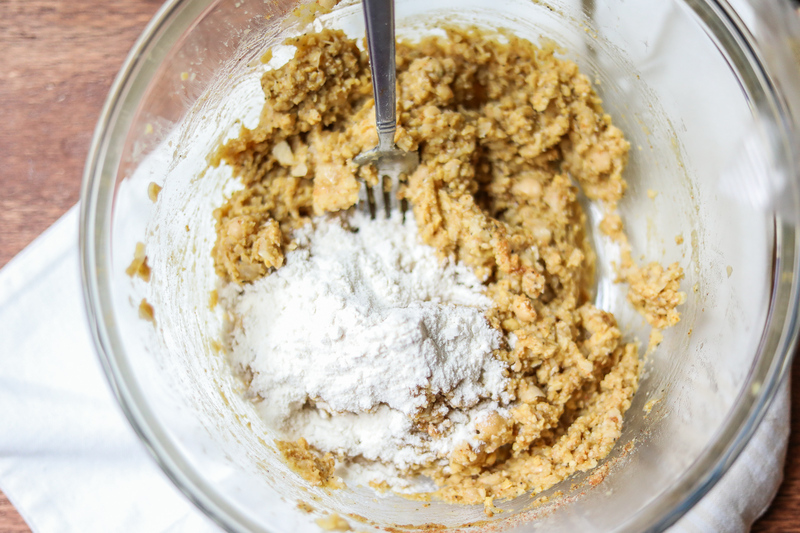 I’ve already prepped the mix, and may have licked the spoon, which I know you’re not supposed to do with raw egg, but oh well! The mix tasted darn good! 1- I’ve made falafel a few times. They come out pretty well. Ohhhhh I LOVE this recipe! I also made the mistake of waiting WAY too long to try a falafel and now they’re one of my favorite foods. If you ever come to Denver there’s this spot called Shish Kabob (yes, really haha). It’s a total hole in the wall but it has the MOST legit falafel and hummus dishes you could dream of! We actually made falafel sliders the other day and they were delicious! Ummmmm my day today was… overwhelming. I call them chickpeas :). I’m definitely making this ASAP. Especially since I want to try it with the Kite Hill, that sounds like perfection! I love your colorful photos! What camera are you using? 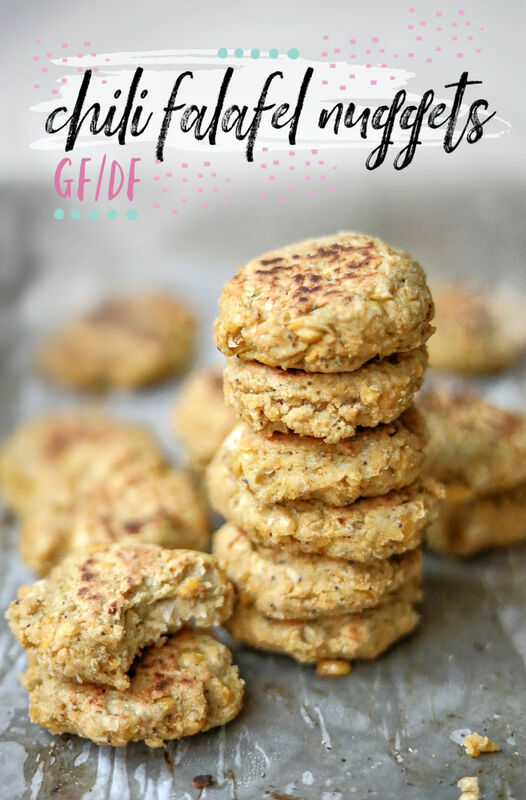 These look delicious and like a great lunch/snack for my toddlers! Love this! 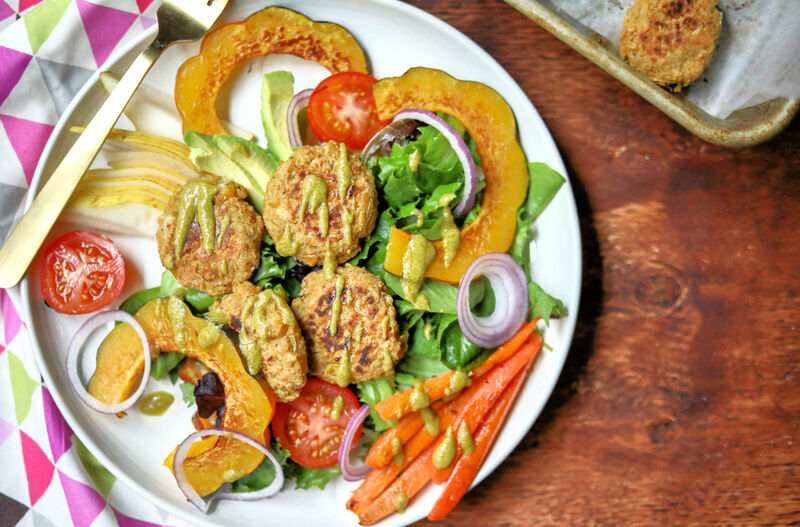 I like how you made your falafel kinda flat instead of balls – makes for more even cooking. I’ve never made them myself, but you may have just inspired me. I discovered falafel late in life too and fell in love. Growing up my mom would always add garbanzo beans to salads and I hated them so I was hesitant to try falafel….but lo and behold my taste buds rejoiced at first bite. There’s this little restaurant here in downtown San Francisco called Sababa that makes the BEST falafel wraps! You would love it! Yes! These were soooooo much easier for cooking! Try making them yourself for sure. They’re so much cheaper and you’ll be hooked! ohhhh I bet I would love that place for sure! Yum I love falafels! The first time I had them I was on vacation with my friend’s family and we also went to Pita Pit and I got them. And I fell in love. I’ve made them at home a few times. The very first time was terrible haha, but since then, much better! Hahaha everyone needs to experience Pita Pit’s falafel!! Mine were horrible the first time too! lol I bet yours are so good ! Thanks for sharing this recipe! They look delicious. I tried to make these before with a different recipe and it was a disaster. lol. I’ll have to try again using this one!! I call them chickpeas 🙂 & my day in one word is – busy! Have a good rest of the week!!! My day today in one word would have to be “bewildering.” It’s been a very long last couple of weeks, and I am so glad it’s almost the weekend! I can’t wait to hear how it turns out for you! Ohhhhh that sounds like an amazing way to add more to your Caesar salad!!! Hahaha I used to be so confused too! Thrifty Finds, Fall Touches, Mum Goals, & Tasty Eats! 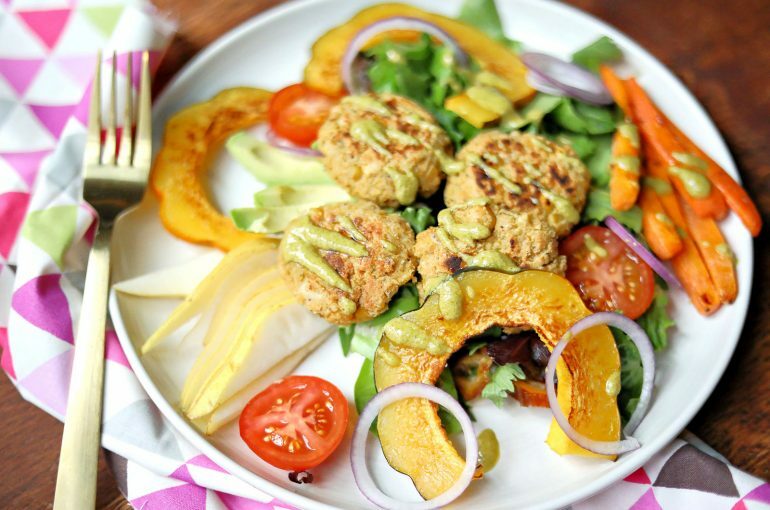 I tried eating the raw vegan diet for a week.